Talent professionals across multiple industries would agree that there is an increasing demand for talent with the digital skills that will ultimately help shape the future of their companies. In fact, a new report from LinkedIn and Capgemini revealed that more than half (54%) of organizations agree that a digital talent gap is hampering their digital transformation programs -- the process of applying digital technology to all aspects of the business -- and that a shortage of digital talent has cost them a competitive advantage. The global report, The Digital Talent Gap - Are Companies Doing Enough?, explores the state of digital talent in today’s workforce and provides powerful new insights into the makeup of the digital talent gap and mechanisms to address it. What does a digital talent gap mean for a talent professional who is recruiting for specific roles, a learning and development executive who has to develop a curriculum to address specific capability gaps, or a CHRO who needs to understand the retention and development needs of his or her workforce? Tapping into data from 530+ million LinkedIn members, in collaboration with Capgemini’s worldwide, cross-sector research program, the report provides a comprehensive perspective on the digital talent gap -- in other words, which hard and soft digital skills are most in-demand, relative to the current supply of digital skills. Whether you’re in the retail, banking, insurance or the consumer products industry, you’re looking for employees who can update your IT systems, design mobile apps or develop the artificial intelligence engine driving your digital products and services. We categorize these employees as digital talent -- people with both the hard digital skills (such as data analytics) and soft digital skills (such as comfort with ambiguity) that constitute a “digital-first mindset” and are necessary for a successful digital transformation. Cybersecurity and cloud computing, for example, were found to be the two skills in most demand and are also those with the greatest talent gap. 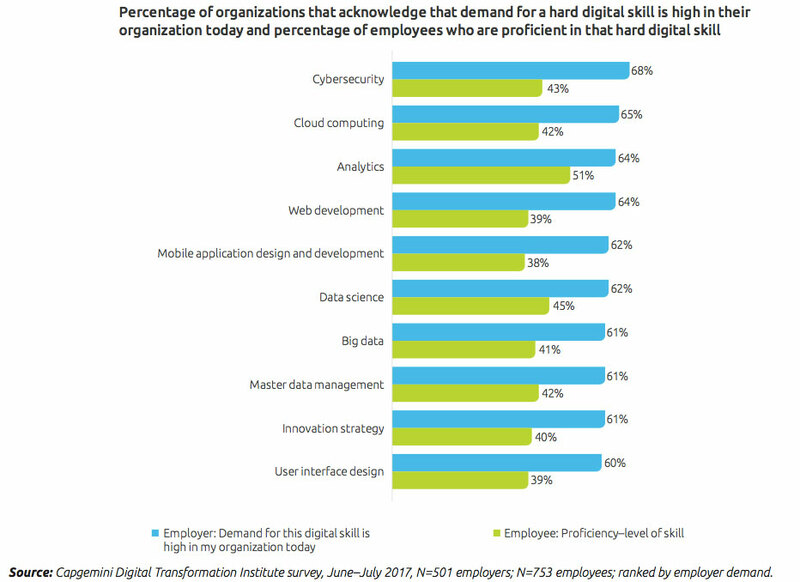 For each of the top digital skills, 60-68% of employers surveyed in the study acknowledged high demand for the skill, while only 38-45% of employers considered their employees to be proficient in the skill. Why these skills? Well, these are the foundational skills that will fuel the top roles that companies expect to become more prominent in the next 2-3 years such as Information Security/Privacy Consultant, Chief Digital Officer/Chief Digital Information Officer, Data Architect, Digital Project Manager and Data Engineer. Digital talent is migrating across geographies, industry sectors and companies. 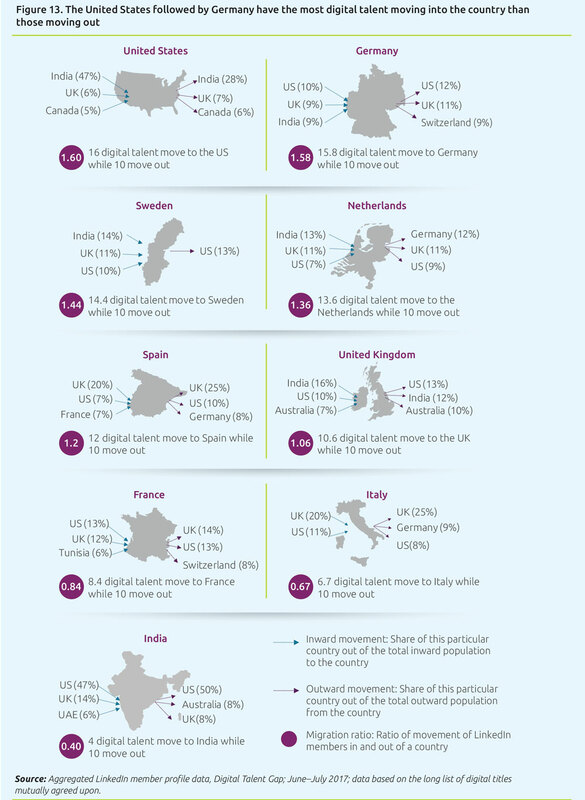 On a geographic basis, the United States, Germany, Sweden and the Netherlands are seeing strong net inflows, indicating that these countries are the top preferred destinations for digital talent. In the U.S., for example, LinkedIn data shows that 16 employees with digital skills are migrating into the United States for every 10 that move out. And yet, the United States still ranks among the countries with the widest perceived gap between digital skill demand and digital skill supply -- with 70% of organizations in the U.S. citing a widening talent gap. On the other end of the spectrum, India has a strong relative supply of digital talent, but much lower inbound migration -- for every 10 digital talent moving from India to other locations, only four are moving to India. As a solution, a majority of digital talent (60%) have taken training into their own hands and are investing their own time and money, most commonly to be on a par with their colleagues on the required digital skills. With more than half of digital employees (55%) willing to move to another organization if they feel their digital skills are stagnating, offering better training options is key for future success. LinkedIn Learning Solutions gives LinkedIn members access to a digital library of over 11,000 expert-led courses in five languages, and courses that teach digital skills are one the rise. Over the past year, data science and agile programming have both propelled into the top 10 most popular courses on the platform. As a talent professional, understanding how to attract, source and retain digital talent can be the difference between staying ahead of the competition and falling behind. Above all, the report showed that talented people with the skills to move your organization forward, want to join ambitious team, and gravitate towards those that share their vision for a digital future. Look the “digital” part: Organizations can make themselves attractive by communicating their digital ambitions and delivering what talented people want. Understand the reality of your talent brand relative to the needs of the digital talent that you need to attract, develop and retain. Ensure your own digital employees’ stories are well represented on your social channels, in videos, blogs and other posts. Ask the right questions: Checking in with business leaders is the first step in truly understanding what type of digital talent you should be hiring. Are you looking to grow into new markets? Is there a new area of the business you’re interested in? Is there a focus on innovation? Find out what your business leaders care about before making your hiring decisions. Figure out the mix of digital skills that you need: Insights on a specific talent pool could be key to informing your talent strategy, including where the most underutilized digital talent is in the world and how to best reach them. Imagine if you knew the differences between how machine learning professionals respond to InMails vs. how web developers respond. Use insights to get a glance into what you’re currently doing and what you can do to improve your ability to reach and engage the specific talent pools that you need to attract. Offer more effective training solutions: While sourcing new talent is our usual go-to for high-demand digital talent, there may be an opportunity to look at your current employee-base. Evaluate which skills can be developed versus acquired based on historical internal mobility within your company and data on how other companies are building digital talent. 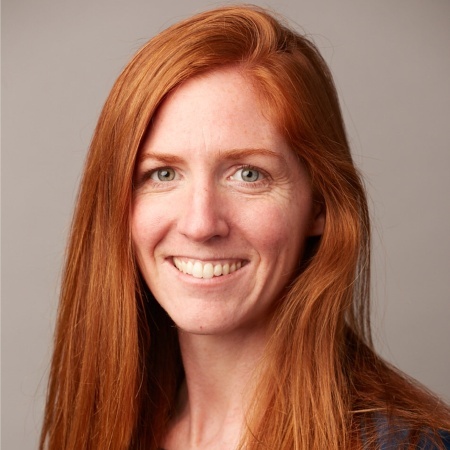 Upskill your top performers to take on digital roles by surgically targeting training efforts to focus on specific areas of development and experimenting with new formats. After all, great businesses are built on people, and talent is one of the key reasons companies succeed or fail. Today, with innovation in technology opening up the market for talent acquistion - the vast majority of candidates are now online and candidates themselves have abundant information on opportunities - being proactive in attracting open talent is more important than ever. By using Insights to find and develop the talent your organization needs, you’ll be one step ahead of the competition to close your talent gap. The report surveyed 753 employees and 501 executives at the director-level or above at large companies with reported revenue of more than $500 million for FY 2016 and more than 1,000 employees. The survey took place from June to July 2017, and covered nine countries—France, Germany, India, Italy, the Netherlands, Spain, Sweden, the United Kingdom, and the United States and seven industries—Automotive, Banking, Consumer Products, Insurance, Retail, Telecom, and Utilities. Based on aggregated LinkedIn data, we analyzed the demand and supply of specific digital skills and digital roles globally and within our nine priority countries and seven sectors. For purposes of this research, LinkedIn defined “digital” broadly to include a long list of digital hard and soft skills and digital job titles that LinkedIn and Capgemini believe represent [nearly] all technology innovation-related activities. More detail is below. To see additional details on the methodology and to download the full report, visit https://www.capgemini.com/resources/digital-talent-gap.